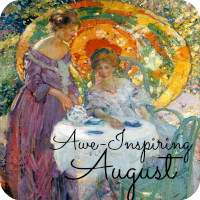 Artful Affirmations: Awe-Inspiring August! Computer Vacation! 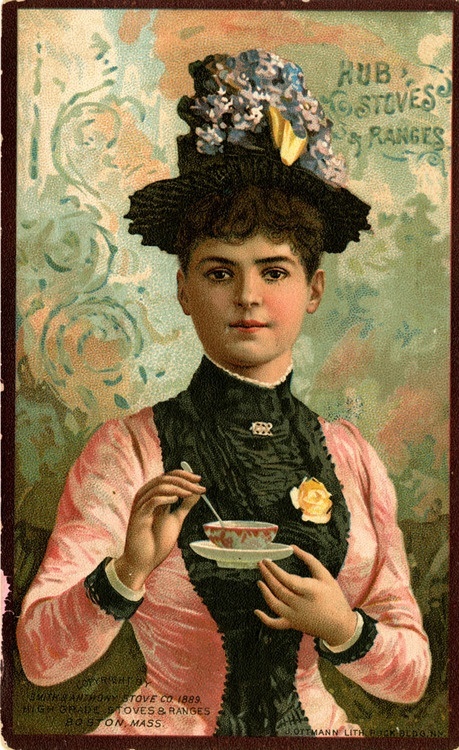 This lovely lady is sitting in a garden enjoying a cup of tea. summer foliage and flowers in the background. with dye from a happy afternoon of fabric magic. I did these pieces a few weeks ago. 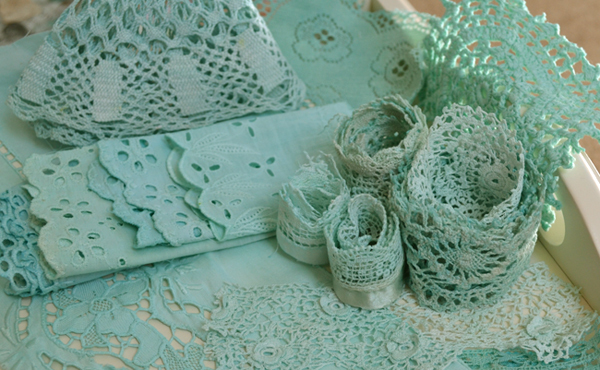 Lovely things to use for collage art. I enjoy making banners, and I have a few more ready to hand sew. say a year and a half ago??? 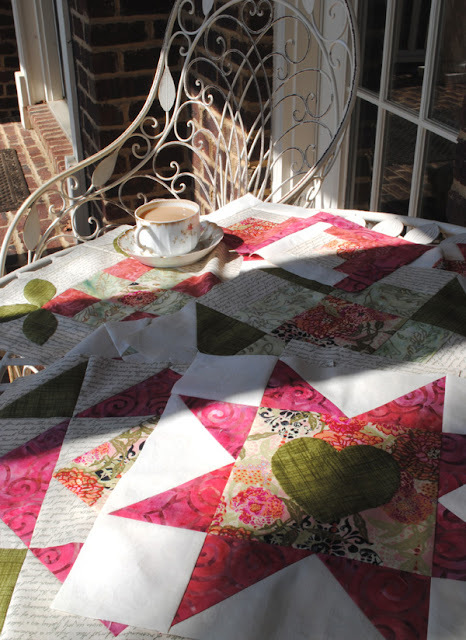 I want to stitch my quilt together. I have other hopeful project ideas. And I don't want to miss a minute of it. So I am planning a lot more of that! And to allow the Inspiration and relaxation in! And I will miss connecting each week. I will miss Tea Cup Tuesday...oh my! In fact, I am wondering if I can do it??? Have any of you taken a month off? Do you have special August plans? Sounds like a good idea to me. I recently didn't blog for 5 weeks... but that is not the same as turning off your laptop for a whole month! I think you will find you suddenly have more hours in your day!!! Maybe I should try it too!!!! You're allowed to take a month of vacation Terri! LOL And when you'll come back, you'll have many new things to show us! All your dyed beauties are incredible, the pink ones are my favorite. To share with us when you return. It sounds wonderful, Terri! enJOY the rest of your Summer. Have fun and we will see you in September. Yes, you almost have me thinking the same, I know we all need to a break from time to time. I understand how you feel! Enjoy your month off, Terri! There are not enough hours in a day to do all the fun things our soul needs us to do because of real life demands requiring such a huge chunk of time. See you in September! Have fun? 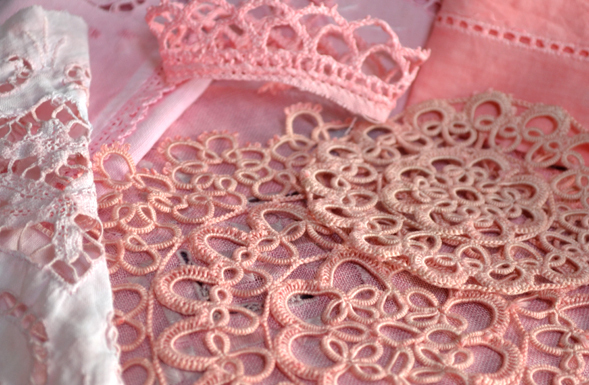 Terri your dyed fabrics and laces are divine and I know you'll be creating gorgeous things with them! Good luck with your month long break and good for you too! I've only ever done that a week at the most-and it was only cuz we lost power :)Will miss you but am looking forward to all the inspiration you will have to share. Enjoy! 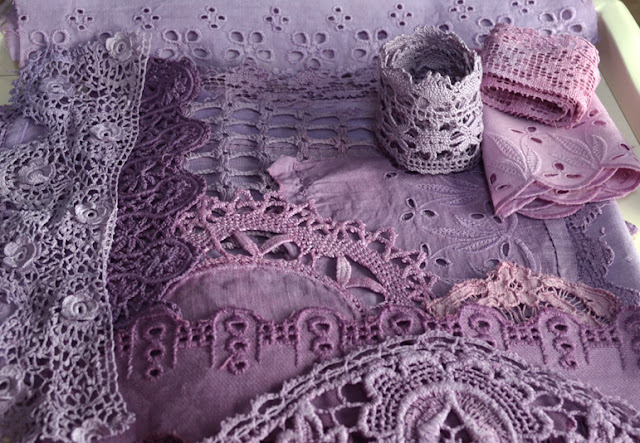 Dear Terri, your fabrics are all stunning colours, the tones so beautiful! !-I would love to dye some more ,also. Oh I understand about the months off -but never tried!! Only one week or so, I have been away from my computer and friends,-and that is ok for me!!! I don`t think I could leave for a month !! BUT it would be given me so much more time, to create and enjoy other things, you are so right, my friend!...So enjoy, and see you soon again,-I will be here waiting to hear and see news!!! Glad I could help and can't wait to see the quilt when your month is up. Think it's a very good idea and wish I coukd achieve it but at the moment I know I coukdn't manage it. Will miss you but like to think of you being the lady in the picture. And a well-deserved rest and time to play it is!! I'm thrilled that you've decided to focus on your art(s) and let the rest sit on the shelf for a month. I've only taken off two weeks at a time, and I must say, I did miss my blog! Yet, all is sweeter upon return. I've been traveling full speed this summer with an online retreat and another class and I'm looking forward to a trip to the MD shore in August. So, dear Terri, I will be missing you and thinking of you and smiling...knowing you're doing what you love so much! Enjoy every minute! A month with no computer is mind boggling to me, and I say go for it! Of course you will be missed, but you will be back all refreshed and better than ever. I totally agree Terri. Blogging is fun but it is also time consuming. Such lovely pieces. Enjoy your vacation.. So gorgeous!! Good luck with your project!! 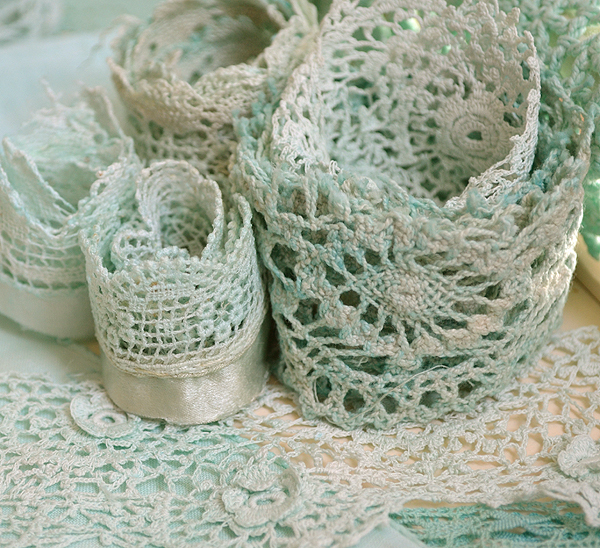 I love your gorgeous new dyed lace pieces and of course your new quilt blocks! you have been a busy lady! I wish that I could join you in shutting down the computer - unfortunately my two jobs entail working on it all day! And with Back to school around the corner it is my busiest time with web work! I will envy you as you get that much deserved rest! You deserve a month off! Summer is short and blogging can keep one extrememly busy as in my case. I feel I need a break too and I might just take one. My hubby is on vacation and my two weekly parties keep me at the computer quite a bit so you have given me some food for thought. Enjoy your time off my friend and we'll enjoy your company when you get back. I've only taken a day off before. A month will be hard. Especially staying away from Pinterest! I know what you mean about being inspired by other blogs. You blog happens to be one of them. You have some gorgeous material for awesome projects. Maybe being away from the computer will make you super productive. Let us know the outcome of it. Happy vacation! Oh and your comment was so sweet. It made me all happy and fuzzy warm inside. Thank you! Hi Terri, I think it's a great idea to take a break. I really haven't blogged much this summer with working on my studio, being sick and now a new grandbaby. I think summer is a great time to break with the computer. I love Pinterest. I find it really relaxing just to make boards. Just saying today how I need a break - a real vacation. Seeing my son and grandbaby the third week of August so August is special to me this summer, too. Hope to hear all about your retreat in September! What a lovely image! I wish you happiness and lots of free time while you take your vacation away from the computer. I haven't done hardly anything with my blog for months, but I still can't stay away from my computer! Too much to do . . . I hadn't read this post and was missing you! happy to read it is for s good reason! hugs and see you in September! Wow..what a gorgeous array of colors..so magical Terri..love the creations you share..they are such stunning treasures...such an old world feel..very charming! Wishing you a beautiful time away..enjoy!Missing your presence in blogland and waiting to welcome your return!